​At University of Plymouth our approach to partnership creates a lasting legacy for our community. Over 50,000 people celebrated the 150th anniversary year with University, of Plymouth many now committed to future events and activities. Over £720,000 raised during the anniversary year to support our celebrations and partnership activities, including fundraising for the new 150th student scholarships to enable Plymouth students to fulfil their potential, and securing a large grant from the Heritage Lottery Fund and Big Lottery Fund towards the restoration of Drakes' Place Gardens and Reservoir. 150th memorabilia available as corporate gifts proving very popular from publications and a contemporary music CD to small badges inspirationally drawn from our coat of arms. 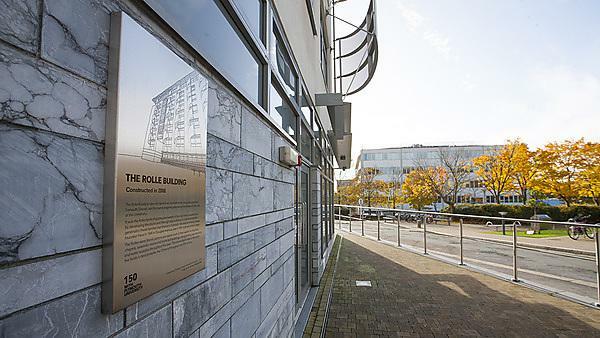 Distinctive 150th plaques commissioned for campus buildings to capture their naming convention, historical legacy and Plymouth connectivity. 15 endangered and rare species of trees planted on campus representing international partnerships with Plymouth. Student designed VC Enterprise Awards trophy for 2012 extended as a campus artwork - 150 enterprise sculpture - concept continuing for future awards. Campus trails developed embracing artwork, building plaques, trees and geological aspects of the campus to enhance the campus visitor experience, building on our 'Curious campus' tour including development as a digital trail delivering a deeper educational and academic experience and connectivity with wider city trails - incorporates 150th legacy projects including the stone unveiled by HRH The Duke of Edinburgh to commemorate the official opening of the £19m marine building. Plymouth Print launched to the arts community both within and outside of University of Plymouth. Involvement of prestigious individuals such as Nick Park inspiring the campus with creative artwork. Plymouth Prestige Lecture series attracting significant speakers and evolving into The Plymouth Lecture. Sea Portraits, unveiled during the inaugural Plymouth Marine City Festival, being extended to showcase Plymouth people inextricably linked with the sea, positioning Plymouth as a marine city. Marine themed flowerbed designed by a pupil from Marine Academy Plymouth retained on campus for re-planting year on year. Plymouth Gin 150 cocktail served by UPSU staff and students at key corporate and partnership events. A University mascot unveiled on our anniversary day available for student, staff and community use - the pelican comes from our coat of arms. Strategy for 2020 launched at the Vice-Chancellor's Public Address. Founded our new Faculty of Medicine and Dentistry, the only modern university with both medicine and dentistry. Student experience during the anniversary year contributing to their employability and future career potential. Celebrated and embedded our bold, exciting new brand 'With Plymouth University'.